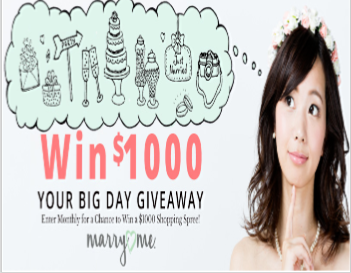 Oriental Trading Company “Your Big Day” $1,000 Monthly Giveaway – Win $1,000 in OTC gift cards! Win $1,000 worth of Oriental Trading Co. gift cards (12 winners)! 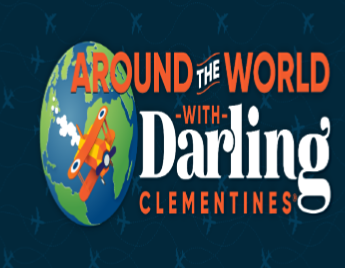 ENTER SWEEPSTAKES HERE – Oriental Trading Co. Sweepstakes page. ENTRY LIMIT – ONLY ONE ENTRY PER HOUSEHOLD PER MONTH WILL BE ACCEPTED. ELIGIBILITY – The Giveaway is open to lawful permanent U.S. residents of the 50 U.S. states and the District of Columbia who are of the age of majority in their home state as of the start date of the Giveaway. SWEEPSTAKES ENTRY PERIOD – The “Your Big Day” $1,000 Monthly Giveaway begins at 12:00 a.m. (Eastern Time [“ET”]) on January 1, 2019 and ends at 11:59 p.m. (ET) on December 31, 2019. PRIZES – One (1) prize in the form of one $1,000 worth of OTC Gift Cards for a total monthly value of $1,000 will be awarded each month (“Monthly Prize”), for a total of twelve (12) Giveaway Prizes (“Giveaway Prizes”). The approximate retail value of the Monthly Prize is $1,000, subject to OTC Gift Card terms and conditions. No transfer, or cash or other substitution of prizes is allowed, except that Giveaway Entities reserve the right, in their sole and absolute discretion, to substitute a prize or prize component of comparable or greater value. Prize will be delivered within seven (7) business days after eligibility is confirmed and OTC has received back from the winner the required affidavit and release form. Giveaway Entities will not replace any lost or stolen prize once in the possession or control of the prize recipient. Total ARV of Giveaway Prizes: $12,000. 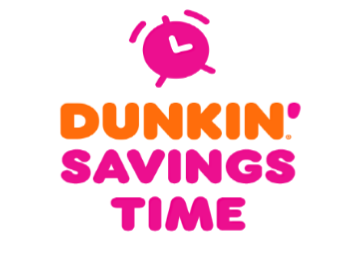 Dunkin’ Savings Time Sweepstakes & IWG – Win a $5,000 home improvement gift card! Win a $5,000 home improvement gift card! ENTER SWEEPSTAKES HERE – Dunkin’ Sweepstakes page. ENTRY LIMIT – Each entrant may enter/play one (1) time per day during the Promotion Period. ELIGIBILITY – Dunkin’ Savings Time (the “Promotion”) is open only to legal residents of the fifty (50) United States (including District of Columbia) who are at least eighteen (18) years old at the time of entry. SWEEPSTAKES ENTRY PERIOD – The Promotion begins on March 6, 2019 at 12:00 a.m. Eastern Time (“ET”) and ends on April 5, 2019 at 11:59 p.m. ET. PRIZES – Sweepstakes Prize: ONE (1) GRAND PRIZE: $5,000 home improvement gift card, terms and conditions apply. ARV: $5,000. Odds of winning the Sweepstakes Prize depend on the number of eligible entries received during the Promotion Period. prize package bundle consisting of Dunkin’ Donuts assorted flavored coffee, ready to drink coffee, and a tumbler. ARV: $135. ONE HUNDRED (100) SECOND PRIZES: One (1) coffee brewer. ARV: $99.99. FIVE HUNDRED (500) THIRD PRIZES: One (1) Dunkin’ branded tumbler. ARV: $60. FIVE THOUSAND (5,000) FOURTH PRIZES: One (1) $25 Dunkin’ Donuts egift card. ARV: $25. WINNER’S LIST – : For a winners list, visit https://bit.ly/2sVYqE8. The winners list will be posted after winner confirmation is complete. 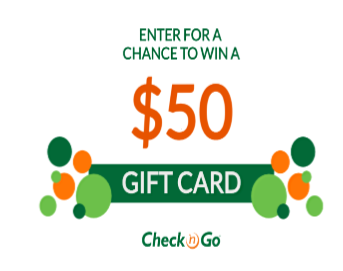 Check `n Go St. Patrick’s Day 2019 Sweepstakes – Win a $50 gift card! Win a $50 gift card (4 winners)! ENTER SWEEPSTAKES HERE – Check `n Go Sweepstakes page. ENTRY LIMIT – Limit one (1) sweepstakes entry per person/Facebook and/or Instagram profile. ELIGIBILITY – Sweepstakes is open to all legal residents of the United States, District of Columbia, and Puerto Rico, who are above the age of majority in the state or territory in which they reside at the time of entry. SWEEPSTAKES ENTRY PERIOD – Check `n Go St. Patrick’s Day 2019 Official Rules begins on March 6, 2019 10:00 a.m. Eastern Standard Time (EST), and ends on March 17, 2019 11:59 p.m., EST. PRIZES – Sponsor will award four (4) winners with one (1) gift card valued at fifty dollars ($50). WINNER’S LIST – For the list of winner(s), send a stamped, self-addressed envelope, postmarked at any time during the Term for the Official Rules and no later than the 15th day of each month to: Check `n Go St. Patrick’s Day 2019 Official Rules Winner, PO Box 36378, Cincinnati, OH 45236. VT residents can exclude return postage. Bath & Body Works The Can’t-Miss Gift Card Giveaway – Win a $500 Bath & Body Works gift card! 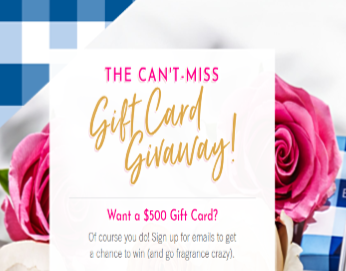 Win a $500 Bath & Body Works gift card! ENTER SWEEPSTAKES HERE – Bath & Body Works Sweepstakes page. ENTRY LIMIT – You may enter only once during the Promotion Period. If you are already signed up to receive emails from Sponsor, you will still receive a Sweepstakes entry. ELIGIBILITY – Bath & Body Works The Can’t-Miss Gift Card Giveaway is open only to legal residents of the fifty (50) United States and the District of Columbia who are at least eighteen (18) years old at the time of entry. 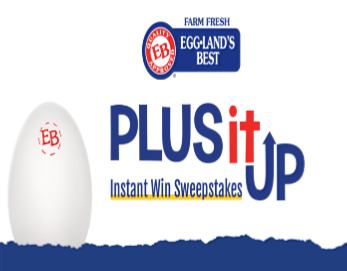 SWEEPSTAKES ENTRY PERIOD – The Sweepstakes begins on March 11th, 2019 at 6:00 a.m. Eastern Time (“ET”,) and ends on April 8th, 2019 at 11:59 p.m. ET. PRIZES – ONE (1) GRAND PRIZE: $500 Bath & Body Works gift card. Terms and conditions apply. Approximate Retail Value (“ARV”) of the prize: $500. WINNER’S LIST – For a Winner’s list (after April 30, 2019 and before May 30, 2019) send a self-addressed, stamped envelope to: Bath & Body Works The Can’t-Miss Gift Card Giveaway, Winner, c/o Ventura Associates, 494 Eighth Avenue, Suite 1700, New York, NY 10001, ATTN: HD. 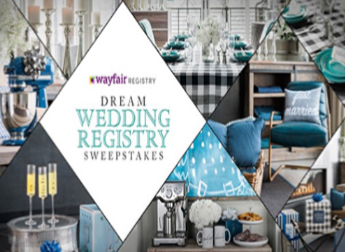 HGTV Dream Wedding Registry Sweepstakes – Win a $2,500 Wayfair gift card & more! 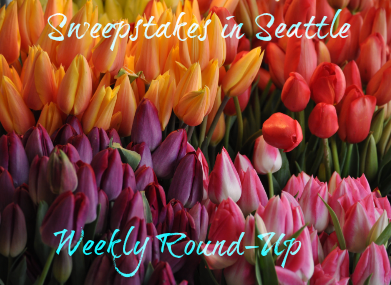 Win a $2,500 Wayfair gift card & a KitchenAid Mixer! SWEEPSTAKES ENTRY PERIOD – Beginning at 9:00 a.m. Eastern Time (“ET”) on February 19, 2019 until 5:00 p.m. ET on March 19, 2019. PRIZES – Grand Prize: The Grand Prize Winner will win the following (the “Grand Prize”): (i) $2,500 Wayfair gift card and (ii) a KitchenAid Stand Mixer. Approximate retail value (“ARV”) of the Grand Prize: $2,879.99. Weekly Prizes: The Weekly Prize Winners will win the following prize corresponding to the week in which he/she was drawn (the “Weekly Prize”): (i) Week 1: KitchenAid Convection Countertop Oven (ARV: $129.99); (ii) Week 2: KitchenAid Cold Brew Coffee Maker (ARV: $99.99); (iii) Week 3: KitchenAid Five Speed Blender (ARV: $129.99); (iv) Week 4: KitchenAid Seven Cup Food Processor (ARV: $99.99). ARV of the Weekly Prizes: $459.96. Daily Prizes: Each Daily Prize Winner will win the prize that corresponds to the Entry Period for which their winning entry was drawn, as further described below in Section 12 of these official rules (each a “Daily Prize”). ARV of each Daily Prize: See Section 12 below. ARV of all Daily Prizes: $6,650. 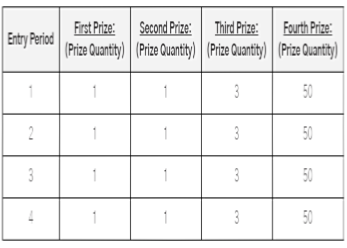 WINNER’S LIST – Beginning on or about April 10, 2019, you may obtain the name of the prize winners by going to the Website. 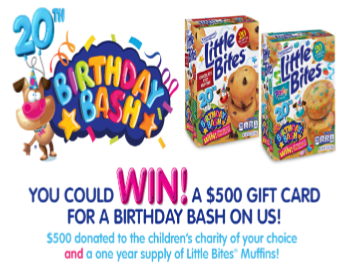 Entenmann’s® Little Bites® 20th Birthday Bash Sweepstakes – Win a $500 VISA gift card & more! Win a $500 VISA gift card, a year supply of Little Bites (20 winners)! Plus, Entenmann’s will make a $500 donation in each winner’s name to a children’s caused based non-profit. ENTRY LIMIT – Limit one (1) entry per person regardless of method for the duration of the Promotion Period. ELIGIBILITY – Promotion is open to legal residents of the fifty (50) United States and the District of Columbia, 18 years of age or older as of date of entry. 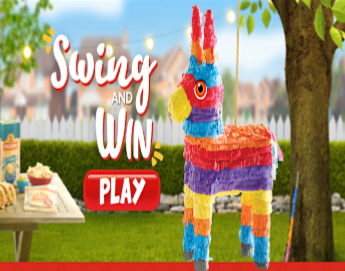 SWEEPSTAKES ENTRY PERIOD – The Entenmann’s® Little Bites® 20th Birthday Bash Sweepstakes starts on January 21, 2019 at 12:00:00 p.m. Eastern Time (“ET”) and ends on March 29, 2019 at 5:00:00 p.m. ET. PRIZES – GRAND PRIZES (20): Each winner will receive a $500 VISA gift card which may be used to create the ultimate birthday party for their child(ren) and their friends, a one (1) year supply of Little Bites muffins awarded in the form of fifty two (52) coupons, each redeemable for one (1) Little Bites product up to $5.00 in value, and Little Bites will make a $500 donation in winner’s name to a children’s cause-based 501(c)(3) non-profit organization of winner’s choice. Approximate Retail Value (“ARV”) of each Grand Prize package: $1,260. WINNER’S LIST – For the names of the winners (available after April 15, 2019) send a self-addressed, stamped, envelope by June 10, 2019, to: Entenmann’s® Little Bites® 20th Birthday Bash Sweepstakes Winners, 255 Business Center Dr., Horsham, PA 19044.